To view more pictures, interactive maps and the full, detailed description of the Gateway at SoNo community, please Login. 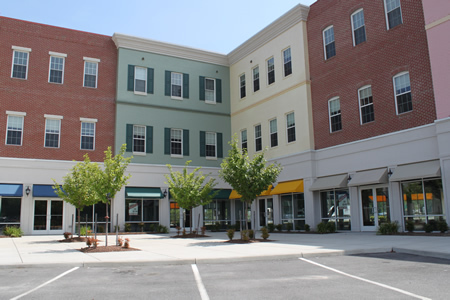 Buying a new construction condo at The Gateway at SoNo helps to revitalize a historic area in Hampton Roads. Properties here are so much more than mere real estate, they are part of a cultural movement. Transforming this section of Chesapeake, VA, into a thriving community is something to take pride in; there’s no wonder so many people are on board. The homes in this new construction development are as diverse as the residents themselves. Each condo offers something special for today’s homebuyer. Some of the properties combine retail and office space with living space while some are designed specifically for residential use. Those who like wide-open spaces may find the loft condominiums especially appealing. The singles, retirees and couples who have a hip sense of style will see home ownership has a different feel at The Gateway at SoNo. Located in southeast Virginia, this new construction neighborhood is convenient to so much. Eastern Virginia Medical School and military bases like Naval Medical Center Portsmouth, Norfolk Naval Shipyard and Coast Guard Base Portsmouth are just a hop, skip and a jump away. Grab some quality time with that significant other and enjoy a picnic at the Elizabeth River Boat Landing and Park. See world-class musical events at the Virginia Opera. Get some sun at some of the area’s beaches. Shop and dine at properties like MacArthur Center in nearby Norfolk. A condo in The Gateway at SoNo gives residents every city amenity at their fingertips. Don’t always think new construction is built out in the countryside in a traditional neighborhood. The properties here were designed by people thinking outside of the box for people thinking outside of the box. Owning a condo in The Gateway at SoNo can widen horizons and rebuild this community. Now who wouldn’t want to be a part of that? Send me more information about the Gateway at SoNo new home community. Our agents gladly offer FREE property tours of Gateway at SoNo, Chesapeake and homebuyer consultations to all serious buyers.